'I am about to embark on a new body of work,' he says, excitedly, and his enthusiasm is contagious. In this case, 'body' may well be a double entendre, as his work is swarming with them. His is a collection of bodies that are simultaneously inviting and inimical, lovely and loveless, rather purchasable (Palmer’s best paintings still go for only a few thousand) and thoroughly unobtainable. There would be Jazz playing and tea and custard creams going at half time. Sometimes classes would go on in the pub down the street. 'Often friendships are made through the classes which keep going way beyond the classes. I know Patrick has kept in touch with some of the friends he made here,' Bobby says. As he developed his artistic skills and befriended people of a similar disposition, it became increasingly clear to Palmer that he wanted to prioritise his passion for painting over his office job. He now considered going down the path he had signalled many years before, but which had been out of bounds to him then. 'Even though my mother was artistically gifted, I was nevertheless completely discouraged from doing art as a career as I was good academically. But, hey! I finally got round to it.' At forty, Palmer finally left his job in media and decided to dedicate his time and efforts to art instead. 'Losing my office job,' was not much of a sacrifice for him, as he 'hated having a boss, and realised that art was what I was best at.' He enrolled at Heatherley’s in Chelsea and later at the National College of Art and Design in Dublin. 'Going to art college as a mature student and being happier than ever,' proved it was the right thing for him to do. Michael Clark, one of Palmer’s friends and mentors, seems to deserve some credit for the emergence of Palmer’s recognisable style. 'He took my work apart,' Palmer says. 'And told me to focus on tone first, before embarking on colour. It took me in a different direction'. This is all very well, but to what height does Palmer's wish for innovation soar? I submit that he continues on paper and canvas the art form Rodin arguably invented in sculpture – the fragment as a finished work, usually trunks and body parts in which Palmer's wretches can bury their heads. Palmer is not the first draughtsman to leave parts of the body largely unfinished: Michelangelo, too, drew with great delicacy some body parts, whilst leaving others bits out. (This technique of leaving out accentuates the great delicacy and precision with which the body parts that are finished have been observed.) So many opportunities are opened up by this use of fragments, by omitting and distorting body parts, and Palmer's considered and balanced use of this fairly ancient technique is certainly not without merit. There is also a tangible movement in Palmer's figures, and yet hardly any of them seem to want to move: they are trying to hide themselves from the world, yet their bodies are there for all of us to see. His red chalk figures are often darkened figures in light spaces – and the viewer's gaze inevitably intensifies in order to perceive of them. For example, just as when one tries to focus on an object situated between oneself and the sun, one can clearly distinguish the silhouettes, but filling them in is more visually challenging. Whereas, nowadays, the figurations on conventional drawings and paintings need not be deciphered as much as the conceptual quality they may contain, these chalk drawings present us with a (mild and pleasant) visual challenge from the very start. Palmer's painted bodies - pockets of frigidity interjected into planes of radiant heat – are exposed to the beholder, but their faces are either entirely hidden or half-turned away, making us depend primarily on the colour in which they bath to construe their inmost emotions. The bodies are dialed back by shades of shadow almost as if the painter deems them disgraced and blasphemous (or is this merely a trick to tantalize?). Although the bodies are put centrally, what we really see are landscapes of the mind. There is no world we recognise; no platform of familiarity on which we can stand to survey the surroundings with a connoisseur’s binoculars. Instead we are forced to confront the naked truth of a stranger’s inner world and either trust them and take their raw feelings at face value or choose not to understand them at all. These faceless charcoal stumps are perhaps Palmer’s most powerful works to date. Being prepared to show your incomplete and fragmentary work to the world certainly requires a certain baldness and self-confidence. History provides us with instances of unfinished artworks celebrated for their rough and sometimes metaphysical character. Rodin had not started working on his Eve with the intention of leaving it unfinished: the sculptor described how he was left with a work in progress after his sitter could no longer pose for him due to her pregnancy. He chose to retain the work and exhibit it for the first time in 1899, on the eve of the new century. In this sculpture the sensuality of the female body is juxtaposed with the modesty of the gesture she makes by lowering her head and crossing her arms. Her protective attitude expresses her shame and remorse after the Fall. Eve here represents the state of moral frailty - a capacity to be easily seduced and led astray - which successive generations of men and women would be born in. Are all of Palmer's figures, beautiful but born in shame, daughters of this Eve? Edgar Degas is another inspiration to Palmer: Palmer's drawing Girl with Hands in Her Hair is evidently based on Degas' La Coiffure ('Combing the Hair', to be found in the National Gallery). In Rodin by Degas Palmer ventured into the world of hypothesis, asking 'what if'. What if Edgar Degas, later in life a painter of brash colours and fragmentary compositions, had translated Rodin's Kiss into paint? Here, finally, Palmer allows his figures not to withdraw in themselves, but to withdraw in each other. How does Palmer compare to other artists of our age and day? 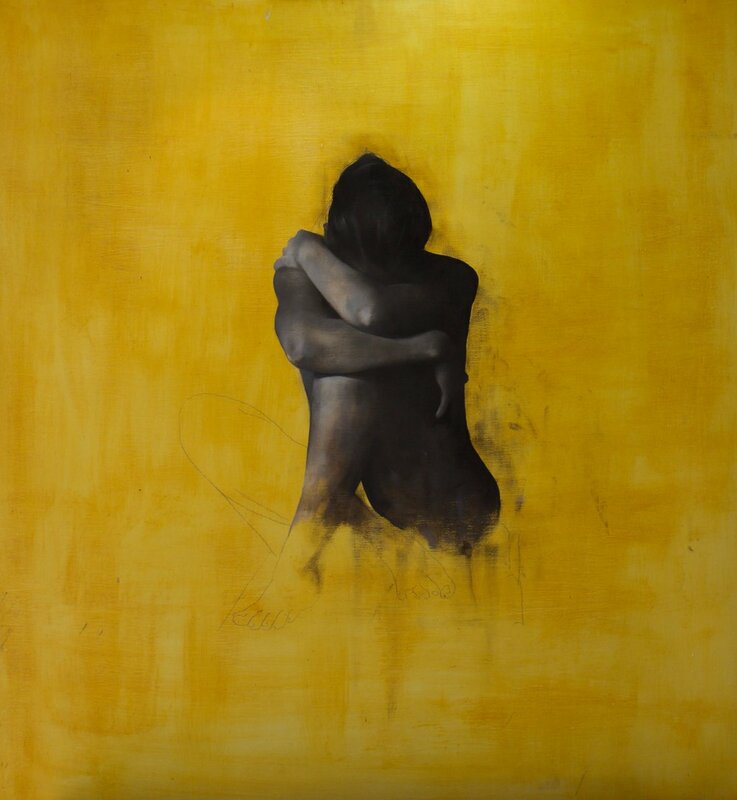 By having his models avert their faces they are endowed with a certain anonymity, whereas the face is pivotal to the work of, say, Mark Demsteader. Does Palmer simply want to do away with those body parts that humanize rather than sexualize? Indeed, in his work there are a number of instances where the head simply disappears into thin air – but here our cerebral network of associations may be kind and guide us to the statues of the late Classical and Hellenistic period of antiquity as found in contemporary museums. There fragmented bodies, their protruding elements partly broken and sometimes restored, abound. The shapes of these statues allegedly contributed to the pop-inspired drawings of musician Daniel Johnston, which feature women that are static, frozen in posture and in form, and whose torsos are headless and limbless. One reason for an artist to leave out body parts is because their creation needs careful consideration and is therefore time-consuming. By not putting in all the details the artist can also lead the viewer's eye to the body parts the artist judges to be important. 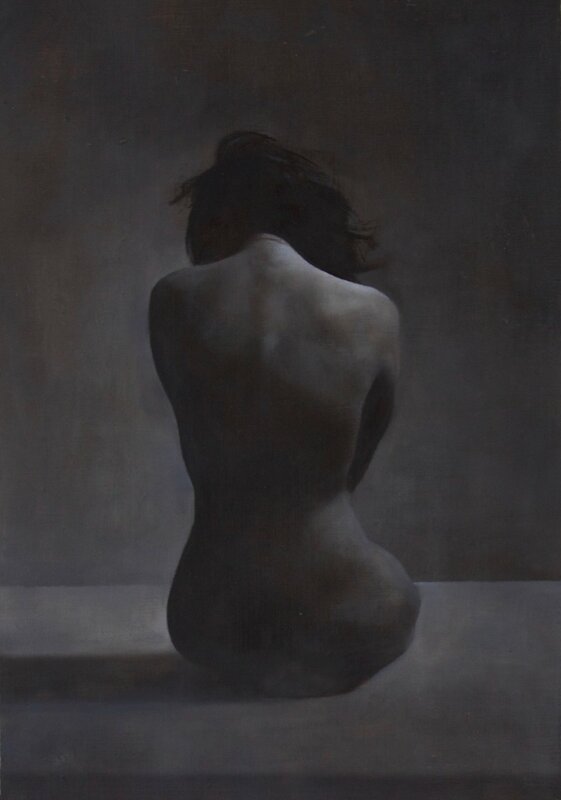 Mark Demsteader tells us that he uses abstract forms of colour tone and line to describe and emphasise his paintings' moods, and I have little doubt that this is what Palmer does too. And though the shapes and curves that Patrick reproduces on canvas and on paper are pleasant, it is this mood - which he expresses through contrasting colours, through disturbing absences, and through lines that make the misery of his subjects manifest - that is truly striking. His works may well be glimpses of some sort of purgatory, where Palmer’s wretches must suffer until all their earthly dirt has been burned off. And as their beautiful bodies evaporate and disappear, so too, perhaps, does love itself. Even if there is no case of cremation, the wretches have undeniably lost themselves in contemplation and perhaps also in the loneliness with which the envious damn those who betray a beauty that is not ordinary, but extraordinary. 'The loneliness.' Palmer says, suddenly. 'Before, you asked me what I think of the art world. Well, that side of it does not suit me at all. I try to go out for coffee or ride my bike as often as time allows, and social media helps too. And let’s not forget my two small, mischievous but wonderful kids. Yeah, they can be fun,' says Palmer, who is about to leave his house and neighbours (one of whom is Anna Friel, the actress - Palmer sketched her). I have the feeling Palmer, with his gentle smile and warm embrace of life, is hiding something from us. Whether this relates to his ‘undiscovered’ artist mother, his deceptively aesthetic approach to making portraits, or an unnoticed meaning in his art which he expects us to uncover ourselves, I do not yet know. However, he promises to keep me posted, and I expect I be will revisiting him and his art sooner rather than later.